The One Condos is a new 80 storey proposed development at the southwest corner of Yonge and Bloor. The design by global architects Foster and Partners is tall, brawny and complex. 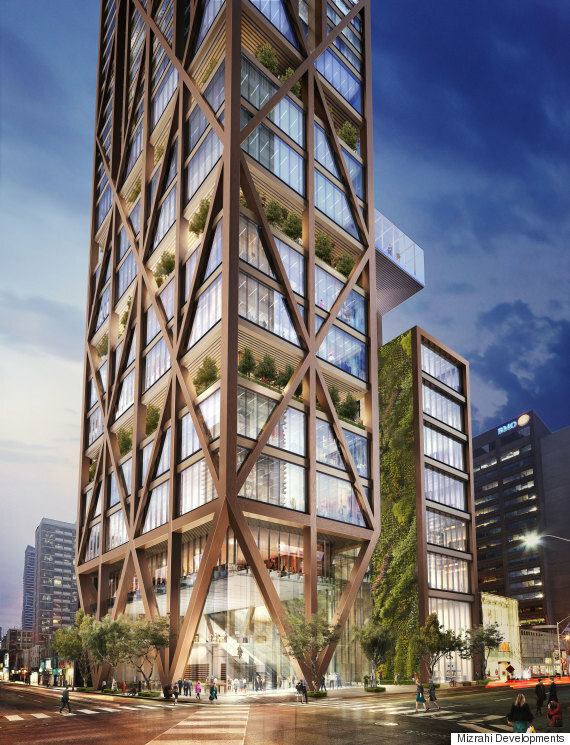 The proposal, which Mizrahi hopes could be finished as soon as 2018, would have eight storeys of retail shops, 600 parking spots and some 560 residential units. Mizrahi said he thinks the building would put Toronto on the international map. The tower, if built as planned, would stand 318 metres tall. For those familiar with Toronto skyscrapers, that’s taller than the First Canadian Place tower, the massive (and city council-approved) Mirvish-Gehry towers set to rise from King Street West and the recently finished 78-storey Aura condo located at Yonge at Gerrard St.
Only the CN Tower, at 553.33 metres, would be taller.